There is no doubt that one of the top games to hit shelves in 2016 was Arkane Studios’ Dishonored 2. That game had the unenviable task of having to live up to 2012’s Dishonored, one of the best action and stealth games of the last couple of years, and surprisingly turned out to be as good if not better than its predecessor overall. An important part of Dishonored 2’s appeal was the fact that you could play through the game as either assassin Corvo or Empress Emily, each having their own set of unique superpowers. This was an interesting design choice that let you experience the story from two different perspectives and enjoy a slightly different gameplay experience depending on which character you picked at the start. This standalone expansion for Dishonored 2 (titled Dishonored: Death of the Outsider) doesn’t offer the same character choice as the main game, though, but it makes up for it by letting you play as the charismatic Billie Lurk (also known as Meagan Foster), one of the more interesting characters to feature in the Dishonored games. Billie is captain of the Dreadful Whale, a ship that serves as your base of operations throughout the game. And while in Dishonored 2 she was Corvo’s (or Emily’s) boatwoman and briefed our heroes before missions, she is the protagonist here. In this expansion Billie sides with former villain Daud (someone whom Dishonored players will remember was behind the Empress’ murder in the first Dishonored game) in order to kill none other than the black-eyed, god-like Outsider himself. The Dreadful Whale will be your base of operations throughout most of the game. Sadly, though, I did not find Billie to be such an engaging character throughout my playthrough. But like Corvo and Emily in Dishonored 2, she does make interesting comments about the game world as you play through the campaign, although truth be told it’s hard to connect to a character you only ever see in the comic book-style cutscenes which bookend each level. Speaking of which, these cutscenes are reminiscent of the ones seen in the old Thief games, which obviously were a source of inspiration for the Dishonored games. 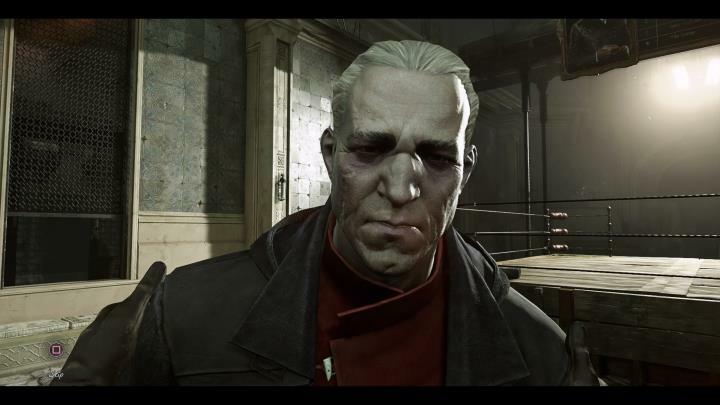 Actually, Steven Russell (who voiced protagonist Garret in the Thief games) played the Corvo role in Dishonored 2, and although he does not feature in this expansion, at least voice actress Rosario Dawson does a fine job voicing Billie Lurk here. It’s a pity that Death of the Outsider doesn’t quite nail the atmosphere of the Thief games though, while supporting characters like Billie’s mentor Daud are also not that great. The game’s assassination target (the Outsider), though, remains a fascinating character through and through, and getting to know the true story behind this black-eyed boy is one of this expansion’s highlights for sure. 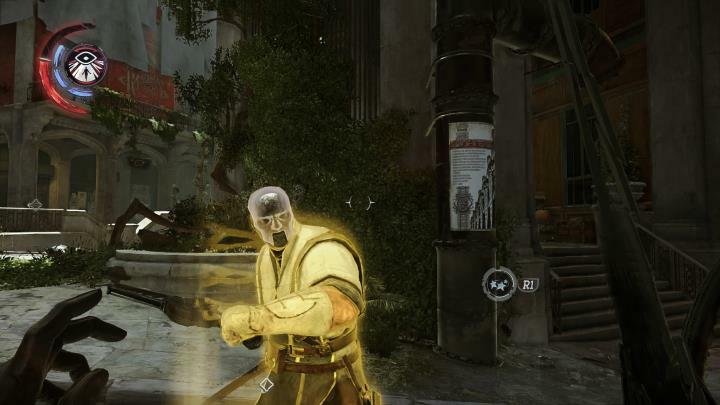 Getting there will require completing each of the game’s missions, which take place in a variety of locations including an underground fight club, a bank and even the Void itself. The game’s fight club and other locations like a conservatory do look the part, and are atmospheric and interesting enough to warrant exploring, looking for secrets to discover within. 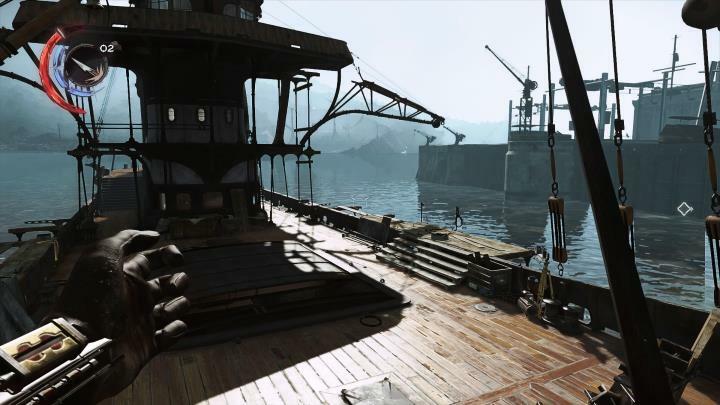 Of course, you also get to explore the city of Karnaka here, although I noticed that the Southern European-inspired city did not seem as alive in this expansion as it did in Dishonored 2. There are few characters roaming about the streets, and aside from hostile guards, you will encounter few people to interact with while going about your business in Karnaka. 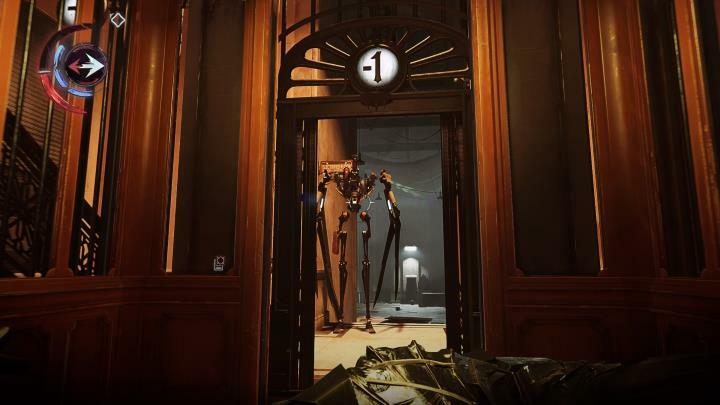 What’s undeniable is that Dishonored: Death of the Outsider locations do look fantastic, even if none are as inventive as Dishonored 2’s brilliant Clockwork Mansion though. But the graphics are truly great, and even a cut above those of the main game. This is thanks to the almost photo-realistic textures on display here, detailed art such as the posters and paintings scattered throughout the world and impressive lighting and shadows (the character models are not bad either). Actually, Dishonored: Death of the Outsider is one of the most visually stunning games I have ever played on PS4 or any other platform to date, and that’s certainly no mean feat. 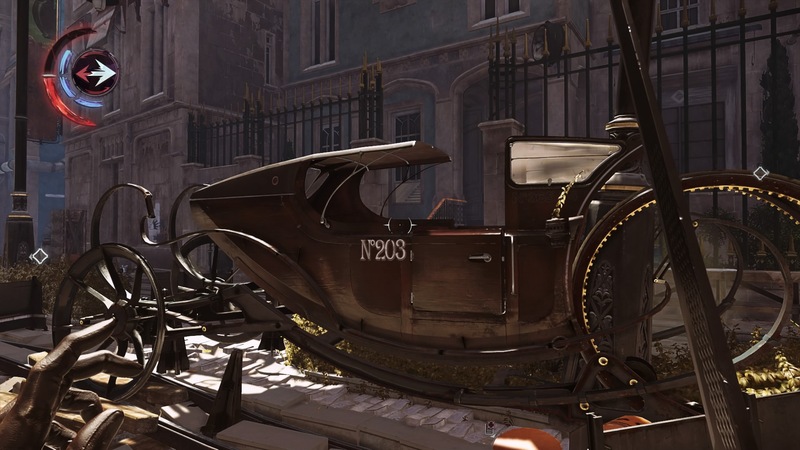 Detailed textures and beautiful art design make this Dishonored 2 expansion one of the prettiest games released on consoles this year. You won’t always have time to appreciate the stunning visuals, though, as there are plenty of enemies patrolling each of the game’s locations. These are as alert and perceptive as they were in Dishonored 2, and will quickly catch sight of you and attack if you are not being stealthy enough. Like in Dishonored 2, melee combat is brutal and bloody, and protagonist Billie is able to dismember, behead and even cut enemies in half if you time your attacks right. Nonetheless, combat in Dishonored: Death of the Outsider can be hard at times, especially if a group of enemies gang up on you (which is a common occurrence as guards will usually call for help from their comrades if they spot you), but learning to block enemy strikes and counterattacking at the right time will see you finishing off opponents in spectacular fashion in no time. Of course, there’s always the possibility of avoiding melee combat altogether and trying other strategies, and thankfully the gameplay in Dishonored: Death of the Outsider is as dynamic as it was in last year’s Dishonored 2, letting you deal with enemies in numerous ways. Like Corvo and Emily in Dishonored 2, Death of the Outsider’s protagonist Billie Lurk has several powers at his disposal. These include Displace, which lets you teleport within a given range, which I not only found uselful to escape from enemies or ambush them by teleporting behind their backs and knocking them out, but it also came handy when navigating the game’s world and reaching high places, for instance. There’s also the “Semblance” power, which allows you to take another character’s form for a while and is useful to walk through hostile areas undetected. It even comes in handy to complete an optional objective at one point by taking another character’s appearance in order to take part in an auction, although truth be told I rarely felt the need to use the Semblance power throughout my playthrough. More interesting is the third special power at Billie’s disposal, called “Foresight” in the game. This lets you freeze time and explore the location you’re in, marking enemies and other stuff such as “bonecharms” to pick up later. Marking enemies using Foresight is useful because they will be outlined in yellow colour, letting you see their movements through walls and ceilings, plus they also get cones of vision letting you stay out of their sight and creep up to them to deliver a fatal blow. And it surely is a fun activity to see what lies ahead using Foresight and mark enemies in order to later ambush them in this Dishonored 2 expansion. As stated earlier, Foresight also lets you mark items such as bonecharms, which will be highlighted in the game world, making it easier for you to pick these up later. Like in the main game, the bonecharms are special items that can be equipped to improve your abilities such as swordfighting, although cursed ones come with drawbacks such as making you louder, for instance. But it was never the case that I found the game so hard that I needed to resort to specific bonecharms in order to survive, though. Direct confrontation is an option, but there are plenty more ways to dispatch your enemies in this Dishonored 2 expansion. There are other interesting gameplay possibilities too, involving other enemy types such as the lethal Clockwork Soldiers you encounter during the game’s good bank heist mission, another homage to 1998’s brilliant Thief 2 game, which had a similar mission. The Clockwork Soldiers are robotic creatures that can slice and dice you in a hurry and are also quite fast, but do have their vulnerabilities, such as the fact that they will turn on anyone if you manage to shoot off their heads, for instance. This can be done with several of Billie’s weapons such as the voltaic shot, and it sure is fun to see Clockwork Soldiers turning on guards and their own Clockwork kin, a clever way of letting you clear areas without having to get your hands dirty. Actually, you can play through almost the entirety of this expansion without engaging in melee combat with enemies, and I was once able to take out a group of enemies from afar after I downed one guard with a long range weapon and others came to investigate, with none of them detecting my presence. It’s moments like these that make Dishonored: Death of the Outsider gameplay’s special, and highlights all the effort that went into fine tuning this expansion’s sandbox gameplay. Of course, this was also true of the main game, and the truth is that this expansion does have its share of quirks like the original game did. For starters, the on-screen font is a tad small, and that makes reading both the interface text and the myriad documents scattered throughout the game world something of an eye sore. This is a pity, because there are plenty of interesting texts for you to read which shed light on the game world, and others like newspaper articles which even comment on your exploits in the game so far. Also, I did not find the “rat whispers” clear enough on occasion (yes, it is possible to listen to groups of rats roaming around the game’s world). These whispering rats act as a substitute for the talking heart Corvo and Emily carried with them during the adventures in the main game. Like Corvo’s (or Emily’s) talking heart, the rats provide clues about how to proceed in the current mission and other interesting details, so it’s a pity that sometimes it’s not so clear what the rodents are trying to say in the game (at least the relevant clues do appear in your journal though). Clockwork Soldiers are deadly, but it’s possible to turn them against your enemies too. The game also features a series of side quests associated to each of the major missions, but I did not find any of these that rewarding, as they mostly involve travelling to a certain location and retrieving a specific object, although at least one of these does make a clever reference to one of Arkane Studios’ earlier games… And one or two require you to be a bit creative too, such as one in which you are tasked with killing a mime plying his trade in Karnaka. Aside from the side quests not being that memorable overall, there are also some minor plot inconsistencies involving the side quests, such as one in which you have to retrieve a bit of evidence incriminating a Karnaka official in dirty business and get it to a journalist in town. The thing is, if you already killed the guy in question the conversation between protagonist Billie and the journalist plays out as if the man is still alive, which is a bit immersion breaking, truth be told. Also, aside from the comic book-style cutscenes which play between chapters and a few cinematic scenes here and there, there’s little to move the story forward, although it’s clear that like the original this is more about its open-ended gameplay, dynamic combat and the numerous ways you can deal with enemies throughout the game. This applies to the Outsider himself, whom you can spare at the end if you wish, a nice twist in this Dishonored 2 expansion no doubt. Dishonored: Death of the Outsider is a solid expansion for one of 2016’s best games, then, and despite its quirks is one that fans of Arkane Studios’ Dishonored games will likely want to check out this year.